Cell phone chatter at 35,000 feet? The US movement to lift the ban on in-flight phone calls just hit some turbulence. 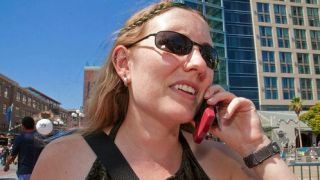 Hours before the US Federal Communications Commission held a 3-2 vote in favor of considering allowing calls, the nation's Department of Transportation announced it will look at banning them all together. A myriad of stakeholders - fliers, flight attendants, lawmakers and more - have reached out to the DOT, and the consensus is they are "troubled" by the idea of in-flight cell phone chit chats. "[A]nd I am concerned about this possibility as well," said Transportation Secretary Anthony Foxx to the Wall Street Journal. The FCC can only determine if the ban on in-flight calls is technically sound, while it's up to the DOT to determine whether mid-air calls are fair to consumers, Foxx said. If the DOT bans calls while the FCC passes its proposal, connected activity like text messaging and browsing would be feasible, but not calls. If the DOT decides not to move forward with a ban, it would still be up to individual airlines whether to allow them. The issue has become a decisive and emotionally charged one as consumers, regulators and airlines debate the merits of allowing calls on technical grounds versus common courtesy. In prepared remarks before a US congressional oversight committee today, FCC Chair Tom Wheeler said, "I do not want the person in the seat next to me yapping at 35,000 feet any more than anyone else. But we are not the Federal Courtesy Commission." He said the ban is out of date - it's from the 1990s - and must be lifted if the aim is do away with "regulations that serve no purpose." The US Federal Aviation Administration recently announced that airlines can allow the use of personal electronics during all stages of a flight, though it expressly forbade in-flight calls. As for the FCC's proposal, it is only at the public comment stage, with no impending action. The Hill reported Wheeler said he was pleased with the DOT's potential action, but we have a feeling this trip could get bumpy before all is said and done. It's been a crazy year - relive it all with Twitter.